Thomas Davis Lamb was born at Cavendish Square, Marylebone, London on 12 November 1815 and baptised at St Mary’s Church in Marylebone on 22 December. He was the third and youngest son of the Revd Dr George Augustus Lamb (born 1782) and Julia Louisa Bancroft, who were married in Marylebone on 25 June 1806. Thomas’s father was Rector of Iden, Sussex and of East Guildford with Playden for 58 years (from 1807 to 1864). On 11 October 1834 Thomas Davis Lamb, aged 18, was matriculated at the University of Oxford from St John’s College, and he graduated from St Mary Hall as a Bachelor of Arts in Civil Law in 1839. He was ordained at Chichester on Sunday 18 December 1842 and was Curate of Playden, Essex for a few months until March 1843, when he was appointed Rector of Windlesham with Bagshot in Surrey. In 1846 he was appointed Rector of West Hackney, London, a living he was to hold for 22 years. Isabella Hudleston was born in Madras, India on 18 June 1823 and baptised there on 27 October. She was the daughter of William Hudleston and Annette Clara Wallace. She had five siblings: William (born and died in Madras 1821), Mary (born 1822, died in Madras in August 1824), a second William (born 1826), Wilfred (born Madras in 1832), and Helena (born Paddington in 1841). Lilian Mary Lamb (born in Hackney in 1867 and baptised there on 15 December). At the time of the 1851 census Thomas Davis Lamb (35) was Rector of West Hackney and living there with his wife Isabella (27) and their first child Isabella (2); they had two servants. In 1861 they were still living at West Hackney Rectory with six of their children: George (8), Annette (7). Hellen (6). William (5), Charles (3), and Dorothea (two months), and they now had three servants. Their eldest child Isabella (12) was paying a visit to her widowed grandmother Annette Hudleston at 19 Camden Place, Walcot, Somerset. Thomas Davis Lamb’s father the Revd George Augustus Lamb, D.D. died on 30 October 1864, and his effects were under £800, which is surprisingly low considering that he owned Lamb House. Thomas and his uncle Richard Curteis Pomfret of Rye and brother-in-law John Collins Allen were trustees for the sale of his estates, but it was not until 28 July 1893 that Thomas contracted to sell Lamb House to the occupier for £1,000. On 1 June 1880 in Brussels, George Augustus Lamb married Margaret Seymour Carpenter. At the time of the 1881 census Thomas Davis Lamb (65) and his daughter Helen (26) were staying at Hartley House, Hartley Westpall, Hampshire with his brother-in-law John Keate, a widower of 58 who was Rector there. His daughter Dorothea (22) was in Chorley, Cheshire, where she was governess to the children of Theophilus Davies, the British consul at Honolulu Mrs Lamb and the rest of the children are hard to find, and may have been abroad. On 11 November 1884 their eldest son George Augustus Lamb (31) died on board the SS Nile with all the other passengers and crew when she hit the Stones Reef in St Ives Bay. On 5 August 1884 at St James’s Church, Paddington, William Pix Davis Lamb married Adelaide Agnes Galloway Nicholl. Six years after his marriage, on 22 December 1891, William died at 8 Shrewsbury Road, Westbourne Park, London at the age of 35. His effects came to £192 13s., and his wife Adelaide was his executor. All three sons of Thomas and Isabella Lamb were now dead, but six daughters survived. By the time of the 1891 census Thomas (75) had retired to Oxford and was living at 8 Bevington Road (a large eleven-roomed house) with his wife Isabella (67) and three of their daughters: Isabella (42), Gertrude (27), and Lilian (23). The other three daughters (Annette, Helen, and Dorothea) are hard to locate in that census. † Thomas Davis Lamb died at 8 Bevington Road at the age of 79 on 17 October 1895 and was buried at St Sepulchre’s Cemetery on 21 October (burial recorded in the parish register of St Mary Magdalen Church). The St Mary Magdalen register notes that he actually lived in St Giles’s parish, and it is difficult to understand why he was buried in the St Mary Magdalen section of the cemetery. The Rev. Thomas Davis Lamb, of Bevington-road, Oxford, and Ockham House, Bodiam, Hawkhurst, formerly a well-known London clergyman, and for over 20 years rector of West Hackney, died last week at Oxford in his 80th year. The youngest son of the late Dr. George Augustus Lamb, D.D., of Iden Parsonage, Rye, Sussex, he was educated at St. Mary Hall, Oxford, graduating as a student of Civil Law in 1839, in which year also he was ordained. After holding for a time the curacy of Playden, Essex, and the rectory of Windlesham and Bagshot, Surrey, from 1843 to 1846, he was, from the latter year till 1868, rector of West Hackney, from 1868 till 1872 vicar of All Saints’, Bishopsgate Within, and in 1872–3 preacher at St. George’s, Albemarle-street. Mr. Lamb, who had been domestic chaplain to the Earl of Mexborough since 1855, was the author of an “Analysis of Pearson on the Creed,” “Sermons on the Eucharist,” &c.
His effects came to £6,150 3s. 1d., and his wife was his executor. On 12 August 1896 at St Giles’s Church, Oxford, Lilian Mary Lamb married Roger James Cholmeley, a schoolmaster from Mellor, Derbyshire and the son of James Cholmeley, a Clerk in Holy Orders. At the time of the 1901 census Mrs Isabella Lamb (77) was living at 8 Bevington Road with her daughter Isabella (52); and her widowed younger sister Mrs Helena Gee (60) had also come to live with her. Her daughter Gertrude (37) was paying a visit on census night to her sister Lilian in Wimbledon. Mrs Lamb was still living at 8 Bevington Road in 1911 with her sister and daughter Isabella, and another unmarried daughter, Annette (57), had come back to live with her. She recorded that four of her ten children were now dead. 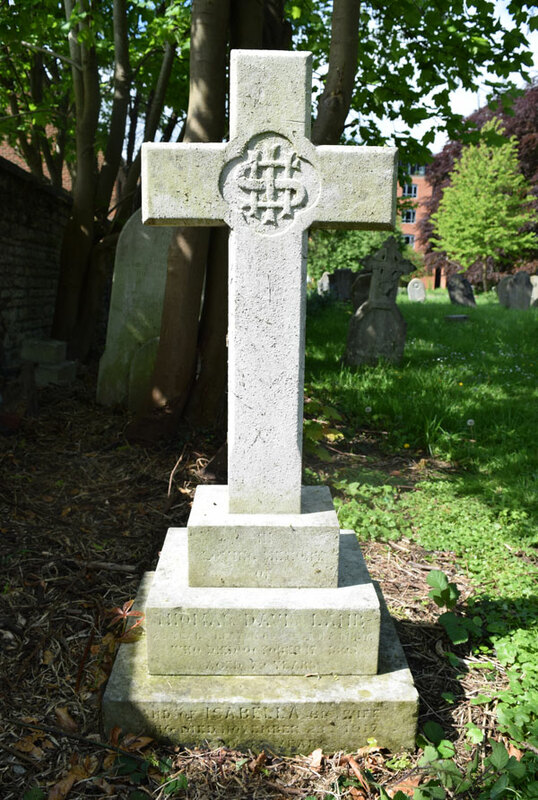 † Mrs Isabella Lamb née Hudleston died at 5 Bevington Road at the age of 94 on 23 November 1917 and was buried at St Sepulchre’s Cemetery on 27 November (burial recorded in the parish register of St Mary Magdalen Church). Her effects came to £2,886 17s. 8d. (resworn £420 0s. 6d. ), and her eldest daughter Miss Isabella Julia Lamb was her executor. Isabella Julia Lamb (born 1848) never married, and was still living at 5 Bevington Road, Oxford in 1915. She died at the age of 88 on 1 March 1937 at 8 Cleveland Place East, Bath. Her effects came to £2,703 13s. 6d., and her executor was her niece Miss Katharine Isabella Cholmeley. Hellen Lamb (born in Bath in 1854, reg. third quarter) is hard to trace after 1881, but was definitely still alive in 1911. Dorothea Lamb (born 1859) is hard to trace after 1881, but was definitely still alive in 1911. Gertrude Catherine (or Katherine) Lamb (born 1864) never married. She died at 14 Bladud Buildings, Bath on 14 January 1934 at the age of 70, although her home was at 13 Russell Street, Bath at the time of her death. Her effects came to £4,719 1s. 7d., and her eldest sister Miss Isabella Julia Lamb was her executor. Lilian Mary Lamb, Mrs Cholmeley (born 1868) was living at 14 Woodside, Wimbledon in 1901 and her sister Gertrude was paying a visit; she had one servant; her husband Roger James Cholmeley (born in Swaby, Lincolnshire in 1872), who had been a schoolmaster, was not at home. Their daughter Katharine Isabella Cholmeley was born in Wimbledon on 1 December 1903 and baptised there on 12 January 1904. They moved to Australia, where Lilian’s husband became Lecturer in Classics at the University of Queensland. He served as a Captain in the Cheshire Regiment in the First World War, winning the Military Cross, and drowned at Archangel, Russia on 16 August 1919. Mrs Lilian Mary Cholmeley died at Bath at the age of 74 in 1942.